During the time of the Buddha Shakyamuni, ceremonial space was defined by nothing more than four stones. Once placed and ritualized, the stones described a sacred space called a sīmā. It was a place in which the actions of the monks were considered not just valid, but also resonant with something much greater than them. This makes sense intuitively, because of the monks' practice of wandering to collect alms and to teach. They needed to be able to create a sacred space without having to construct a building. However, this practice is also a teaching about the role of intention. It is an example from the life of the Buddha as a role model for each person's ability to set an intention that is in accord with the Dharmakaya, the function of perfection in all things. For me it seems that the Buddha knew that our experience of the world, when fully met with the body and mind, could resonate with so much more. That is why he gave the injunction not to simply believe his teaching, but to live it. Thus, though we may be pushed and pulled by our karma and by the barrage of thoughts and feelings present in everyday life, each one of us is also an aspect of the function of perfection. Therefore, we are truly much more than we can possibly know. Discovering our ability to abide in this experience is the practice of a lifetime, and it can only be found by living it. Study is very helpful, but by itself cannot lead to the ultimate, just as reading a menu will not satisfy your hunger. Recently I was asked to participate in an inter-faith panel discussion on creating sacred spaces. I began by talking a bit about the sīmā, and about the Buddhist understanding of body and mind as completely interpenetrating. To use Zen parlance, body and mind are not one, not two. They are not identical to each other, and yet they are completely inseparable. Extending it a bit further, this is also true of the relationship between us and our environment. That is, we are profoundly influenced by our environment, and we are profoundly influencing it. Extending this even further, our environment is interacting with its environment, in ever larger and larger circles until the entire universe is included in each activity of a mundane life. From this vantage point, it is easy to see why Bodhidharma told Emperor Wu that there was nothing holy about building temples and supporting the Dharma. (See the second koan in the Book of Serenity for more on this.) If everything is interacting with everything else then, from the perspective of the absolute, one thing is not more important than another. However, we should not understand this to mean that there is no such thing as a sacred space. We should not confuse the absolute perspective with the relative perspective. We should not fall into thinking that one trumps the other. In fact, it is because this absolute teaching is true that any space can be made sacred by our intention to enact wisdom and compassion. That is to say, since we are part of the function of the Dharmakaya then we can invoke it with our practice, with our intention, with our bodies and voices and candles and incense. We can invoke it with a bow. We can invoke it by including the stones in our ritual. Examining it from another perspective, since we are beings with an inherent connection to the Daharmakaya, we can feel the resonance. It's as if each one of us is a radio, and there is a signal being sent throughout the universe. If you can receive it, then you must be a part of the system.When you receive it, you demonstrate that you are part of the system. Have you ever felt the sacredness of place - a temple, a church, a zendo, a mosque, a sutra, a scripture? You received the signal. It is a temporal arising of resonance due to the expression of intention, due to the expression of wisdom and compassion. And that's where it gets interesting, because it means that our ability to invoke the Dharmakaya in the world begins with invoking it in ourselves. It means that the sacred space starts from within this body and mind, when we set ourselves on the path of following through on our intention to experience the Dharmakaya. So the most important thing we can do in order to create sacred spaces is to find the sacred space within us, the part of us that wants to receive the signal, the part of us that knows there is more to life than meets the eye. Therefore the present building of shrines, fashioning of Buddhas, and so on, is indeed awakening the mind for enlightenment. It is awakening the mind to directly arrive at attainment of Buddhahood, and is not to be destroyed along the way. This is considered unfabricated virtue; this is considered unmade virtue. This is observation of true suchness; this is observation of the nature of things; this is absorption in the assembly of Buddhas; this is attaining the mental command of the Buddhas. 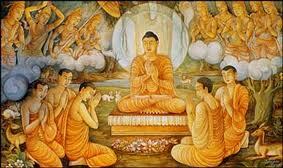 This is the mind of supreme perfect enlightenment; this is the function of sainthood; this is manifestation of Buddha. Outside of this, there is nothing unfabricated, unmade. So I encourage you to find the sacred spaces within, and to bring them into expression in the world because the world needs sacred spaces. And please find the sacred spaces in the world that resonate with the sacred spaces within you, because that's what they are meant to do. We all need to find our sacred spaces.